Indianapolis, IN – Lafayette Steel Sales, a prime flat rolled coil and sheet distributor and coil processor has installed a new high-production Braner/Loopco Single-Loop Turret Head™ Coil Slitting & Packaging Line in its Indianapolis, IN coil processing facility. 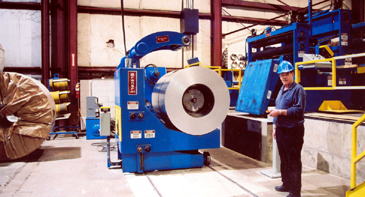 The new Slitting Line processes 60,000# x 72" wide cold rolled and galvanized carbon steel and aluminum alloy coils in gauges from .015" through 1/4" at processing speeds to 1,000 FPM. The new high-production quick-change Turret Head™ Slitting Line is installed adjacent to a Braner/Loopco 72" Computer Controlled Hydraulic Leveler-Electronic Servo Feed Precision Cut-to-Length Line, and expands Lafayette Steel's capacity to service its customers with just-in-time delivery of high-quality close-tolerance slit coil throughout a wide gauge and mechanical property range. 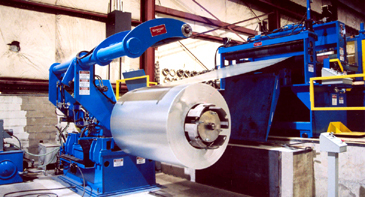 60,000# x 72" x 1/4" Single-Loop Turret Head™ Slitting Line. 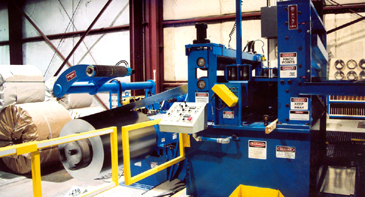 The 72" Slitting Line is equipped with Coil Storage Turnstiles, Entry and Exit Coil Cars, Crop Shears, PVC Film Applicator, a 150 HP quick-change Turret Head™ Slitter, quick-change Strip Tensioner, a 250 HP x 2-ratio Recoiler, and an Automatic Turret Stacker Slit Coil Packaging System. Coil Loading Car is equipped with a unique "wireless" control that allows the operator excellent mobility while maintaining a safe distance from the Car and the coil. 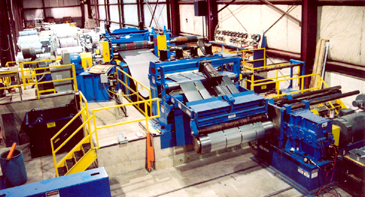 Compact High Pass Line: The Lafayette Steel Slitting Line is an example of Braner/Loopco's high-production, compact high pass line system that positions the Uncoiler and Recoiler at floor level while the equipment between is elevated to match the largest coil OD. High pass line eliminates reverse-bending of the strip against the natural coil-set as the coil is threaded and processed. Because the strip is never reverse bent by force, strip threading is extremely fast and coil-breaks generated by reverse strip bending are eliminated. High pass line design eliminates strip surface scuffing and scratching damage because strip deflector rolls are located under the strip and do not contact the strip surface while running. With a compact 44' Uncoiler to Recoiler centerline dimension, Lafayette's slitting line offers quick and efficient coil threading and superb coil tracking and coil side-wall build-up while occupying minimal floor space. Coils are processed with no reverse strip bending against the natural coil-set, which eliminates qeuipment induced coil-breaks. High pass lines also provide excellent strip tracking and preserve floor space. Entry Coil Prep Station: The Coil Peeler, Pinch Rolls, Automatic Edge Guide, Side Guides, PVC Film Applicator, and Crop Shear are installed on a common base immediately ahead of the Turret Head™ Slitter and close to the Uncoiler. The unique Coil Prep Station design makes heavy and thin gauge coil threading quick and easy while providing excellent coil tracking at high processing speeds. Laser beam aided Uncoiler master coil alignment and electronic Side Guide position readouts reduce coil loading and threading time. Entry Coil Prep Station combines entry coil threading, and guiding, equipment into a single, compact machine that speeds coil threading and improves strip tracking. Turret Head™ Slitter: A 9" arbor x 150 HP 2-head quick-change Turret Head™ Slitter produces precise tolerance slit strips with minimum burr throughout the entire range of gauges and mechanical properties. Turret Slitter arbors are supported in precision machine tool quality bearings mounted in massive one-piece stress-relieved and precision ground solid steel housings that weigh nearly a ton. The rotatable Turret housing is mounted on a 300,000# capacity ring bearing, and the hydraulic cylinder positioned outboard arbor housing rides on zero-maintenance precision machine tool bearing slides. Large aluminum-bronze blocks secure the vertically adjustable upper arbor bearing boxes and allow "zero" axial arbor movement. Huge upper arbor bearing boxes are vertically positioned by motorized anti-backlash screw jacks with electronic encoder digital position readouts that allow fast and precise vertical knife clearance adjustment. Because the exchangeable Slitter heads are never detached, shuttled, or disassembled, the Turret Head™ design is more rigid and precise than any other multi-head Slitter design. In addition, access to the set-up arbors is free and clear with no obstructions so re-tooling is accomplished faster than with any other slitter. A Turret Head™ Slitter exchanges heads in less than 2-minutes.